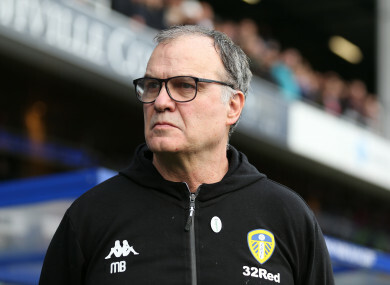 Leeds United manager Marcelo Bielsa pictured at Loftus Road on Sunday. KIERAN SADLIER MADE a brief cameo at the end of Doncaster’s surprise 3-1 win away to Preston North End on Sunday to make his first appearance for the club since leaving Cork City. The forward scored 23 goals in all competitions last season and sealed a move to the Championship outfit last month. With his side two goals to the good the former West Ham and St Mirren forward was brought on off the bench to make his debut. Elsewhere in the FA Cup high-flying Leeds United made an early exit in the third round at the hands of QPR. Aramide Oteh gave Steve McClaren’s men the lead from the penalty spot, before Aapo Halme equalised just two minutes later, with Jake Bidwell hitting a 75th-minute winner at Loftus Road. It was a positive day for Ireland trio Aiden O’Brien, Shaun Williams and Alex Pearce with Millwall in the FA Cup on Sunday meanwhile — their side overcoming Hull City 2-1 to book their passage into the next round. Email “Bielsa's Leeds suffer early FA Cup exit, while Sadlier makes debut as Doncaster shock Preston”. Feedback on “Bielsa's Leeds suffer early FA Cup exit, while Sadlier makes debut as Doncaster shock Preston”.